BEIJING, April 19, 2018 — (PRNewswire) — China sports brand Peak has made a breakthrough in the application of 3D printing technology. The world's first 3D printed volleyball shoes made their appearance at this year's China Volleyball League all-star game, where they were introduced by Peak Sport CEO Xu Zhihua with a member of the Olympic volleyball team, Ding Xia. As is known to all, volleyball is a sport that requires upward momentum, whether it's passing, saving and serving and spiking and so on. All these skills require athletes to complete through a large number of jumping movements again and again ,and excellent cushioning performance is extremely important. After speaking to men's and women's volleyball players, Peak took several pertinent data collections and combined their findings with knowledge of volleyball, such as athletes' needs and skills required, to use 3D technology to build a brand new shoe. 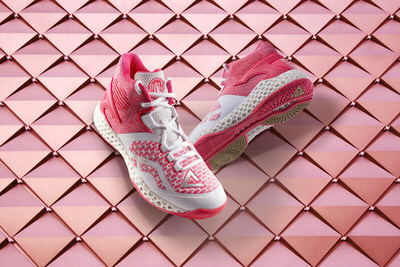 Through the use of SLS laser technology and a more lightweight and flexible TPU powder printed on the bottom of the shoe, Peak created superior cushioning performance. The beauty and performance of this collection of the world's top 3D volleyball shoes announced the success of Peak in the development of volleyball sportswear. "Innovation is the first productive force, and it is also the basis for Peak to go international," said Xu Zhihua, CEO of Peak sports. After succeeding in making 3D printed shoes and 3D basketball shoes, Peak applied this new technology and processing technology to the field of volleyball. Through a series of continuous product innovation and international market development, Peak has become a rising sports brand in the global sports market.